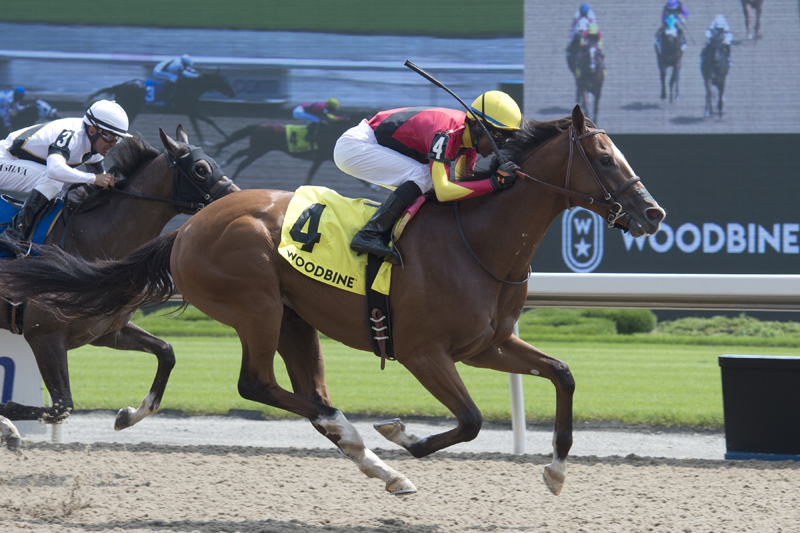 Two-year-old colts and geldings will take their turn on Woodbine’s E.P. Taylor Turf Course on Sunday afternoon in the inaugural $100,000 Soaring Free Stakes. The new six-furlong turf sprint is the colt companion event to Saturday’s Catch a Glimpse Stakes for juvenile fillies. Woodbine’s meet-leading trainer Mark Casse has a trio of contenders in both stakes, which serve as local turf preps for next month’s Grade 1 Natalma and Summer Stakes. Conrad Farms’ undefeated colt Muskoka Wonder leads Casse’s Soaring Free set after breaking his maiden on July 22 and earning his first stakes win in the Clarendon on August 5 — both 5-1/2 furlong sprints on the main track. Bred in Ontario by William D. Graham, the Into Mischief colt was a $130,000 yearling purchase at last year’s Keeneland September Sale. The colt’s dam No Wonder is a half-sister to two-time Grade 1 stakes champion Weemissfrankie. Saints Marching In has already proven himself on the turf, winning at first asking over six furlongs on July 15 for Casse. Live Oak Plantation purchased the grey Kentucky-bred son of Flashback out of the unraced mare Wicked Cricket for $200,000 in March from the Ocala Two-Year-Olds In Training Sale. The Casse-trained Tricky Magician was supplemented to the Soaring Free following top three finishes over both surfaces at Woodbine in his first two starts for owner Gary Barber. Bred in Ontario by Gunpowder Farms LLC, the Magician-Proximity colt was a $125,000 yearling acquisition at the Keeneland November Breeding Stock Sale. His dam is a full-sister to Group 3 stakes winner Confront. The field also includes Crawl From the Bar, who finished second behind Muskoka Wonder in the Clarendon and was stakes-placed in his initial start in the Victoria on July 14 for trainer Norm McKnight. Bred in Ontario by Anderson Farms and Rod Ferguson Farms, the Exchange Rate-Won Opportunity colt is owned by Racer’s Edge Inc., along with Dindyal and Krishna Persaud. Four-time starter Wallace broke his maiden on June 27 at Presque Isle Downs before moving into the care of trainer Sid Attard for the recent Victoria Stakes, where he finished fourth behind Crawl From the Bar. The Kentucky-bred son of Run Away and Hide out of Tales of Paradise is owned by Lucio Tucci. Stud TNT homebred Fluminense ships in to Woodbine for the Soaring Free off a maiden-breaking score in his second start over Churchill Downs on June 30. The More Than Ready-Bonne Rafaela colt will be U.S. Hall of Fame trainer Steven Asmussen’s first Woodbine starter since 2015. The Soaring Free is named for the Sam-Son Farm homebred who was inducted into the Canadian Horse Racing Hall of Fame in 2013. Trained by Mark Frostad, Soaring Free’s 2004 Horse of the Year campaign included a victory in Woodbine’s $1 million Atto Mile Stakes (Grade 1) and a turf track record performance of 1:19.38 for seven furlongs. Another Seaway score in the stars for Carroll? Multiple graded stakes winner Moonlit Promise will give trainer Josie Carroll a chance at a Seaway Stakes repeat this Sunday in the co-featured Grade 3 event at Woodbine Racetrack. The $125,000 seven-furlong stakes race for older fillies and mares shares top billing on the Sunday program with the inaugural $100,000 Soaring Free. Moonlit Promise went three-for-three in fall stakes action last year at Woodbine and was the Sovereign Award runner-up to stablemate Ami’s Mesa, who won the 2017 Seaway Stakes for Carroll. Owned and bred by Hill ‘N’ Dale Equine Holdings, Moonlit Promise has earned top three finishes in the Grade 3 Hendrie and Whimsical sprint stakes during the current Woodbine meet but was tested at 1-1/16 miles in the Ontario Matron last time out in mid-July. Carroll also shared an update on the 2017 champion Ami’s Mesa, who last raced in April, closing for sixth-place in the Grade 1 Madison Stakes at Keeneland. “She’s training very forwardly and getting close to being ready to run,” briefed Carroll, who won the Seaway in 2014 as well with Leigh Court. Code Warrior will move back to the main track where she has won back-to-back editions of the Grade 3 Hendrie. Owned by Zilli Racing Stables, the five-year-old daughter of Society’s Chairman is one of two mares in the field trained by Michael De Paulo. He also conditions Mark Dodson’s Sister Nation, who won last year’s Ruling Angel Stakes. Trainer Mark Casse has a pair of supplements in the field including Stonestreet Stable’s Malibu Bonnie and Live Oak Plantation’s Let It Ride Mom, who kicked off her four-year-old campaign winning the Grade 3 Whimsical and just missed in the subsequent Hendrie and Ontario Matron. Other Seaway Stakes hopefuls in the field include Answer My Call, Corps de Ballet, Just Be Kind, Princess Gibraltar and Thundering Sky.